Japan is trying to keep rapprochement a possibility in light of the worsening situation in Ukraine. Russo-Japanese relations have taken a further hit this week as Japan officially adopts sanctions against Moscow, and meetings between foreign ministry officials have been scrapped. Japan’s attempts to walk a fine line between showing solidarity to its chief ally the U.S. and seeking rapprochement with Russia in order to solve territorial disputes and potentially sign energy deals have not been successful of late. As Russian actions in Ukraine are the main driver in this chain of events, Japan’s options are limited, and Russia cannot realistically expect Japan to abandon its American and European allies. However, the limited effect of the Japanese sanctions shows that Japan is attempting to find concessions for Moscow where possible. Japan’s latest sanctions over Russian involvement in Ukraine were formally approved at a Cabinet meeting on Tuesday. According to the Jiji Press, the sanctions will freeze the assets in Japan of two Russian companies and 40 individuals that the administration believes were directly involved in the destabilization of eastern Ukraine and Russia’s annexation of Crimea. Among those sanctioned is former Ukrainian President Victor Yanukovych, while the two companies targeted are involved in Crimea’s oil and gas industry. Importantly for Russia, however, none of these businesses or individuals have significant assets in Japan. Russia was swift to respond, and on Tuesday it also cancelled the upcoming meeting in Moscow between Japanese Deputy Foreign Minister Shinsuke Sugiyama and his Russian counterpart Igor Morgulov. A visit to Moscow by Japan’s Foreign Minister, Fumio Kishida, originally planned for April, has also been indefinitely postponed. Curiously though, the still tenuously scheduled visit of Russian President Vladimir Putin to Japan this fall has not been mentioned by either side. While Tokyo has issued sanctions along with its Western allies, this latest round has been careful not to target either significant Russian officials or assets. 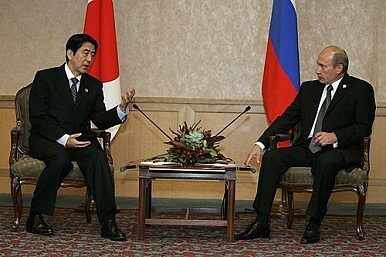 Japanese companies have plans for significant LNG investments in Russia which so far have not been targeted. This is probably because any sanctions that would affect these investments would likely hurt Japan just as much as they would Russia. In all likelihood Japan is hoping that events in Ukraine will be settled quickly, one way or the other, so that it can resume attempts to rebuild its relationship with Russia. The deputy foreign minister’s meeting was expected to address the disputed islands off Japan’s northeastern coast, an issue over which the two sides expected to make progress before the Ukraine crisis. Additionally, Japan has an interest in playing a part in Russia’s potential shift east in its energy exports, exemplified by the enormous natural gas deal it signed with China in May and potential plans for pipelines to the Korean Peninsula and LNG facilities in its far eastern territories. This may be why both sides are hesitant to cancel Putin’s visit later this year, in the hopes that tensions in Ukraine may die down enough for both countries to get back to business. Despite a cordial APEC meeting, Putin and Abe cannot afford to make real progress.